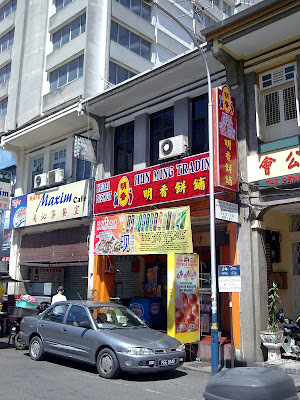 One of my frequent stop for souvenirs whenever I go to Penang, Hun Ming Trading at New Lane, opposite Sunway Hotel, sells a different variety of tau sar pneah (Tambun biscuits) than other branded counterparts eg. Him Heang, Ghee Hiang. 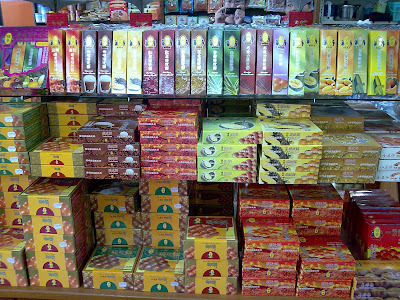 From the picture above, you can see the array of flavours available, ranging from the normal ones to pandan, peanut, coffee, DURIAN, and pineapple. But the favourite choice among my family members is ………….. Him Heang and Ghee Hiang to me both taste pretty good. This one at New Lane is special and authentic for the variety of flavours they offer. 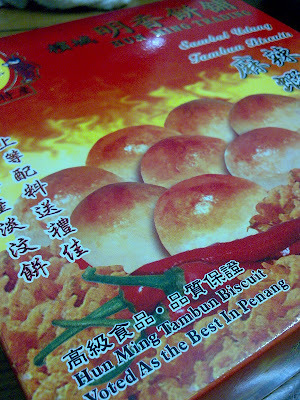 Didn’t know there is sambal udang flavour even staying in Penang..pie sair. you’re welcomed! there are a lot of other flavours as well. Was looking high n low for this ‘ special TSP ‘ seen selling in the airport for RM24 per box which I think was too much to pay for a box of TSP even with extra udang ! Secondly didn’t want to take the risk of buying then it tasted horrible..
Hi barbara. Thanks for the visit. So did you try them? Get them from this outlet at New Lane, or you can sample all the other flavours there, before making your purchases!